The single needle lockstitch machine 367 series for medium-weight materials sets new standards in the medium price category and technology level. The enlarged clearance, the clearly arranged and easily accessible sewing area, the high sewing foot stroke, the high sewing foot lift and the large stitch length offer optimum conditions for the manufacture of home and car upholstery, leather articles as well as technical textiles. The efficient technique, the excellent sewing quality and the multitude of applications make the 367 a universal machine with high flexibility of use. Enlarged clearance allows an improved handling of voluminous work-pieces. 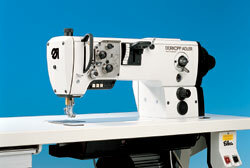 Slim sewing head facilitates the handling of difficultly accessible seam sections. Powerful and effective feeding system with bottom feed, needle feed and alternating top feed guarantees a trouble-free and displacement-free material feed. Extremely high sewing foot lift facilitates the loading, removing, shifting and turning of voluminous work-pieces. Large range of stitch lengths for standard seams and decorative topstitching seams.